This beaut MyoPace packaging design uses simple, clear visual language as well as text as the approach to expressing the core messages and to simultaneously capture and hold the consumer’s attention. As a manufacturer it is your job to package your product well, advertise it to your audience nationally and internationally, take orders, ship your product, collect revenue, handle accounting and so on. The presentation of the product in the competitive in-store environment needs to be carefully considered and when shipping online orders the customer unboxing experience must be taken into consideration also. In the case of the MyoPace EMG device the display carton was encased within an outer shipping carton to ensure the customer’s device and the display carton housing both arrived in pristine condition for un-boxing. Packaging design tangibly bridges the gap between business strategy and design. 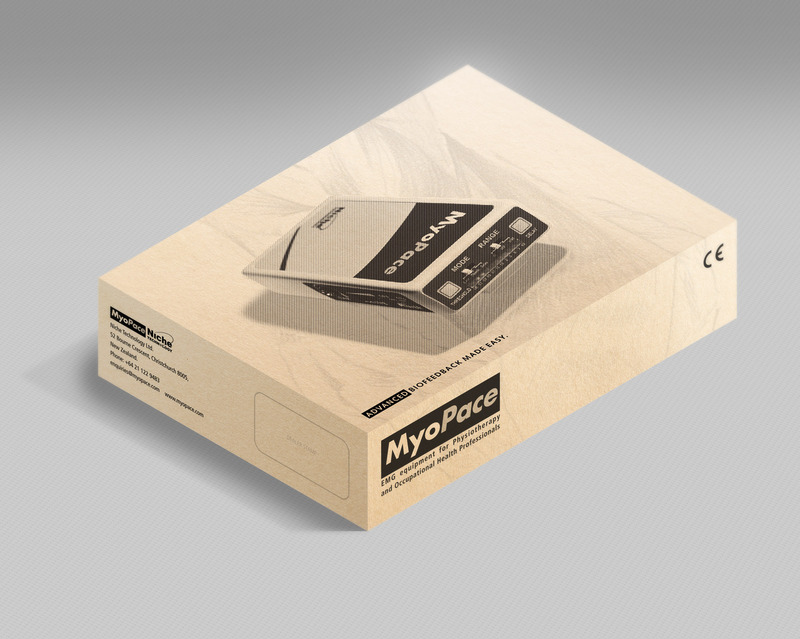 MyoPace flexographic printed outer-shipping carton. Printed one colour, black, onto recycled corrugated Kraft board. Due to rough irregular surface of board medium to coarse halftones are required at no more than 65 line screen. The 27.5 line screen used for the EMG device creates an “organic” recycled look. Packaging is arguably a brand’s most valuable touchpoint. Well researched packaging design is a great opportunity to exercise the power of attractive and useful design. Packaging requires the expertise of multiple disciplines: strategic planning, market research, elements of consumer psychology, graphic design, print production and retail environmental considerations to name just a few. A final piece of successful packaging synthesises this complexity to deliver the brand message to consumers tangibly and directly. Every packaging solution is seen by 100% of a brand’s market, as a result the retail marketplace is highly competitive as products are striving to position themselves distinct from their competition in innovative ways. People crave novel experiences and ideas that remind them of something they have never seen before. Whether browsing for a product on a shelf, internet shopping or stumbling upon them in print media advertising, everyone enjoys the act of discovery. 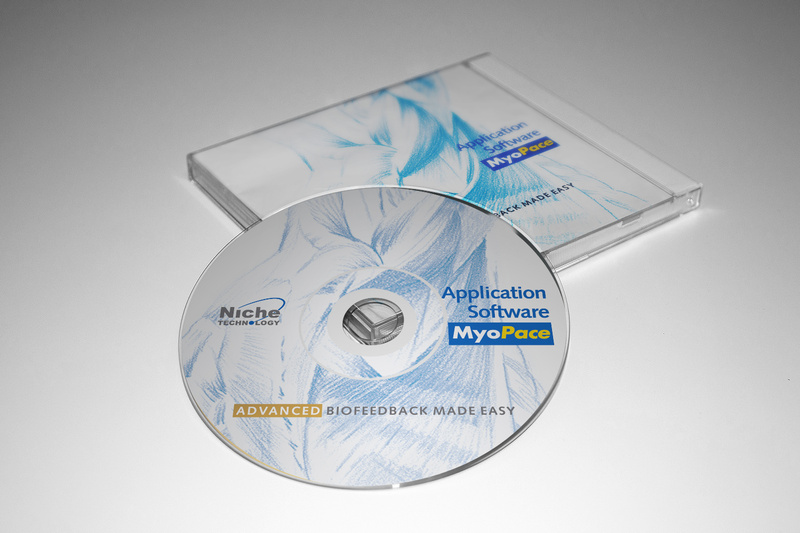 MyoPace Software CD and jewel case. This MyoPace packaging design uses visual language as well as text expressing information to capture and hold the consumer’s attention. It is a packaging that informs, entertains the eye and using good, visually stimulating design aesthetics to really influence the consumer to buy. Packaging design is an enjoyable discipline as it brings rational scientific considerations together with emotionally informed creative design and with craft, meaning that you care about and you know what you are doing. Good package design builds upon creative talent, it takes design informed by an understanding of human behaviour that targets consumers in a compelling, fresh and entertaining way. 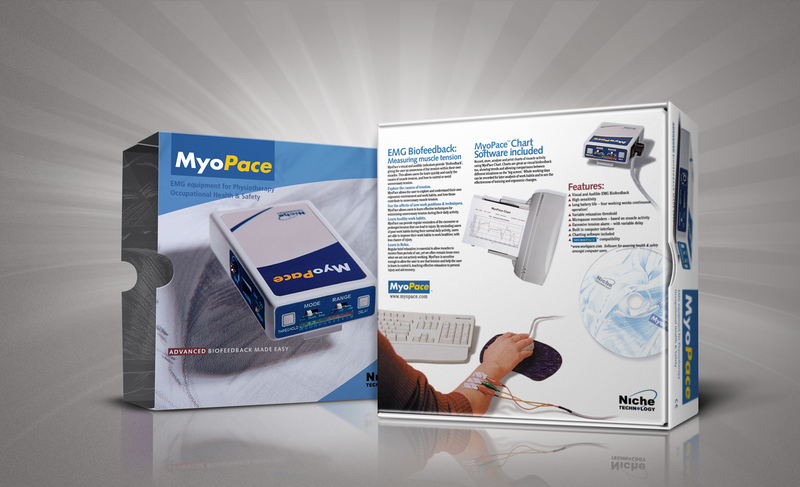 MyoPace EMG Equipment for Physiotherapy carton.